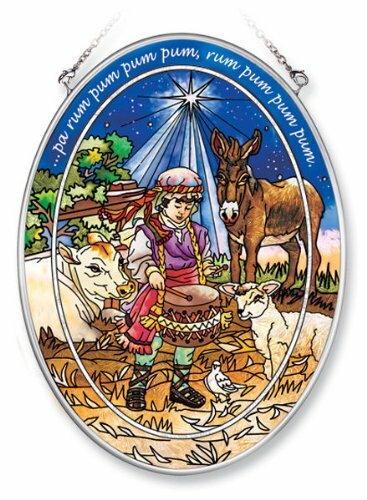 Little Drummer Boy Stained Glass Hanging – Pa Rum Pum Pum Pum. This amazing Little Drummer Boy artwork is an absolutely exquisite gift idea for the drummer in your life! From the collection of a renowned inspirational artist, Dona Gelsinger, comes this colorful Christmas image which features a nativity scene with the little drummer boy gently playing his drum. You don’t have to be a Christian to appreciate this beautiful work of art! This will make a wonderful music touch to your Christmas decorations. Made of hand-painted glass. Brilliant colors and fine detail. Metal hanging chain. This beautiful piece, which can also be an ornament, will make a great impression! Nice gift box included. Approx. 4.5″ x 3.25″.